For the first time in history Chapman Creek was opened to Pink Salmon fishing due to the abundance of Pink Salmon. Chinook are being caught but as of October 1 2015,we still haven’t seen a major run of Coho in Chapman Creek. Courtesy of The Chapman Creek Hatchery. 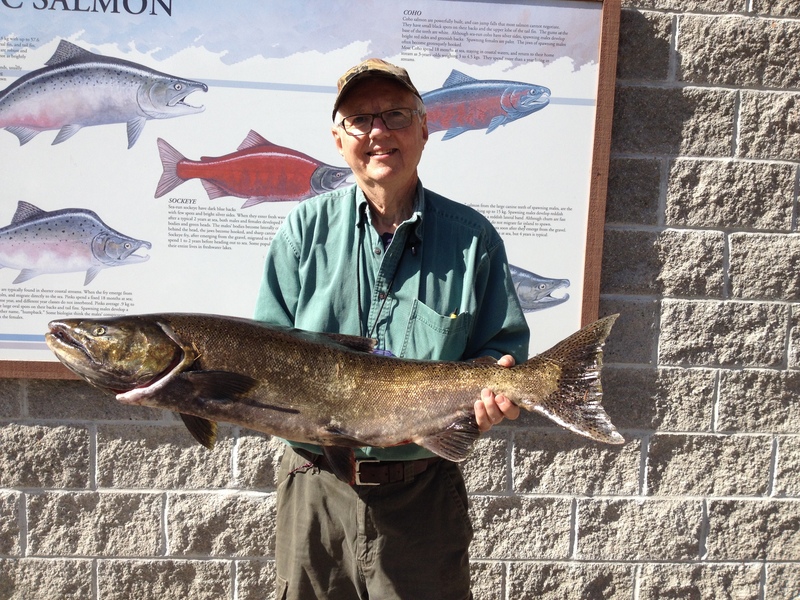 During the next few months as the season goes on, chinook salmon fishing gets better. Places to look will be Bargain Harbour and Bjerre Shoals, Secret Cove and over at Buccaneer Bay and Halfmoon Bay. Note that Halfmoon Bay is more productive fishing on the rising tide. Also, for the fishers that love to mooch both Buccaneer Bay and Halfmoon Bay, live bait is available. Other hotspots will be Trail Islands into Sargeants Bay, and Selma Park which are both great ‘last light last bite’spots. Sargeants Bay is good on the rising tide as well as Selma Park. Down at the southern end of the Sechelt Peninsula look for fish around Howe Sound at Grace or Twin Islands into Gambier Harbour, Hutt Island and try a run over to Tunstall Bay as it is worth it when you have the time and calm seas. Look to Trail Islands, Secret Cove area and around to Halfmoon Bay for keepers; Epsom Point, Buccaneer Bay or out to Bjerre Shoal for good numbers. Let’s not forget our inside waters of Sechelt Inlet and take a look at some of the old fishing posts for Snake Bay, Tillicum Bay and Narrows Inlet. Remember our salmon fishing only gets better! Trail Islands and Davis Bay always have good fishing through these next couple of months with Sargents Bay and Halfmoon Bay being a good area to look for them. The key this time of year is to hug the bottom, many of the productive areas have sand bottoms so let those cannon balls get down and tap so you know you are getting down to the hot zone. Clear marine water drives bait fish and feeders down to 130-170′ during mid-day, and if you mark feed on your sounder get your gear in the same zone. Shiners are a likely prey for salmon, they hug the sandy bottoms and don’t school up like herring. You will see them as a yellow line along the bottom if you have a colored sounder, get your lures down where the shiners are. Army/truck patterns work well when shiners are around, also the Trapper and Mongoose coyote spoon is a good shiner imitation. With the days starting to get longer, the evenings just before dark is a productive time for big fish. They move into shallower depths to hunt, give Sargents or Halfmoon Bay a go, locals like to fish around the 80′ depth just before the sun goes down. We always get reports of springs off Trail Islands, Halfmoon Bay, Epsom Point and Buccaneer Bay. Live bait mooching with herring in depths of over 160′ is a great way to relax and catch a spring salmon. Another trick is to pick out the biggest herring first and only use one #10 hook with a 10-12′ leader and a 3 oz grey beaded weight. Using light tackle while mooching is also a great way to present your bait, 15lb main with 12lb leader. Don’t be to anxious to set your hook, set your drag just to prevent free spooling while in the rod holder. Wait until your reel line is going out at a good pace, works well as a good rule of thumb when setting your hook during a strike. You still want to make sure that the bait fish are showing well on your sounder, that you are out a couple of hours before the tide change and your fishing some bottom structures. Trolling anchovies, strip or whole herring is also productive. The key to spring fishing is to keep your bait or lures as close to the bottom as possible. You may have to deal with flounders, rockfish and of course lingcod. But you will not take many fish if your gear is not down in their face. When trolling, it is also good practice to fish one rod with bait and the other with a spoon. 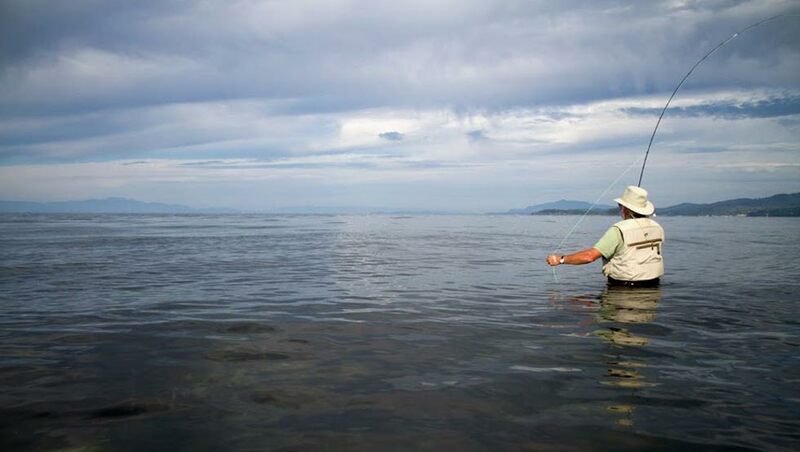 A flasher will call fish into the area of your lures, but with the water being clear the fish may be spooked when they get up close to the flasher. Another good fishing method is to attach the flasher on five foot leader directly to the cannon ball and the lure ten feet up the cable. This allows your line to be free of the flasher. This method gives you the best of both – the flasher is attracting fish to the area, but not spooking them away as they get close to your lure. Also try fishing for salmon on sandy bottoms, 150ft army/truck, black/white spoons with no flasher, it doesn’t get much simpler if you’re a troller. Rule of thumb for lure colors is dark on the over cast dull days and bright and shinny on the clear sunny days. Spring salmon will be at the mouth of Secret Cove in front of the dock at Bucaneer Bay and Halfmoon Bay if the bait is around. Mooching live bait is the best way to catch them and you will find them at depths between 160-180ft during day time tides. You might even want to try to troll the mouth of Coopers Green and Trail Islands from 120ft – 150ft. Crabbing always picks but you have to go shallower, look to 20-60ft at Davis Bay, Porpoise Bay and Sargeants Bay for some nice big keepers. Prawning will improve, so look to the 300ft as a starting point. Tthe commercial prawn season is opening in early May so make sure you get out there soon! Please check the areas where you are prawning as there have been closures in winters past and they may be in place now. Play safe and check the weather reports before going out, leave a note at home so your family knows when you plan to return, and where you are going to be fishing! Clams – prior to harvesting clams always check to make sure you are not digging when there is a PSP Closure by checking out DFO’s Fishery Notice on PSP levels at: DFO Red Tide Closures for area 16 or call (604) 666-2828. To view DFO Management Area maps in order to ensure you know where the boundaries are for various areas or sub-areas that you are interested in fishing, check out their website at: Management Areas Pacific Region. IF YOU HAVE ANY FISHING REPORTS YOU WANT POSTED PLEASE FORWARD THEM! You won’t get better fishing information for the Sunshine Coast.